* Bandanna and a Bow in One! 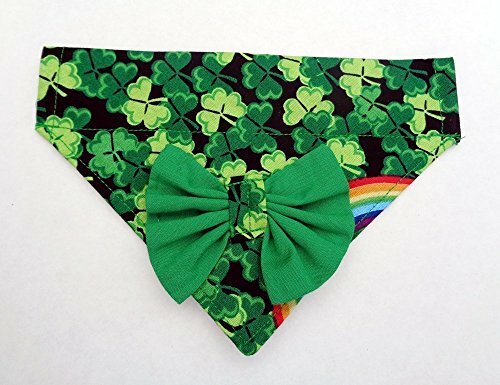 * 3 leaf clover/shamrocks and pot of gold over the rainbow prints dog bandana. Easy on. Easy off. Just thread the collar through the opening and your pet is set. This has a coordinating green bow. Positioning of the rainbow varies due to fabric cut. This is for small breed dogs. Measures approximately 5 inches from the neck to the tip of the bandana.